The 2605dn is compact and quiet in operation. The HP Color LaserJet 2605dn may seem a little expensive, but it's got the specifications to back it up. A 600x600dpi print engine lies underneath the bonnet of this solid, attractive machine, and both duplex printing and Ethernet are supplied as standard, along with a further paper tray option. USB 2.0 is also available for those who don't have the luxury of a network connection. The LCD control panel is easy to use and inserting replacement ink is simple. Although the 2605dn is not the smallest machine on test, it is compact and, most importantly, very quiet in operation. 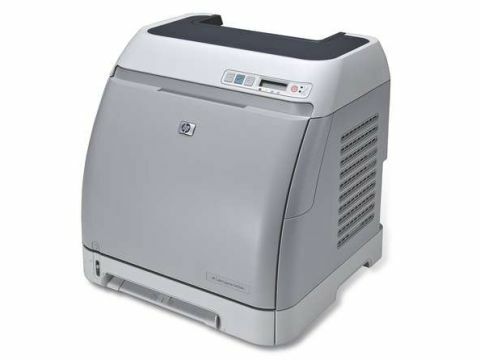 Forget loud clunking noises and vibrations when it's warming up; it's even quiet during printing itself! The supplied RAM is a bit miserly at just 64MB, but you can upgrade this to a much improved 320MB. Print speeds are good, although not spectacular, which is a consequence of the meagre RAM allocation - 11 seconds for a full A4 image is hardly an ice age, though. What is impressive is the print quality. Text is sharp and accurate with clear and crisp definition of each individual character. Colour is very impressive with tones and shades that are bright and natural. Greyscale images are by far the best produced by any of the printers on test, with a perfect level of brightness that brought out the detail. The way the HP performs, and its specification and design really justify the price. It's difficult to find fault with the LaserJet 2605dn. We would like to see a doubling of the RAM to speed things along a bit, but as a small office or home colour laser this printer difficult to beat.